I am writing this article for my own curiosity which I would like to share. I restricted my research and only rely on available English written material which I consider is more trustworthy. Every Muslim believes that Allah Almighty has sent mankind into this world as a matter of test - what is the test? Allah declared in Nobel Qur’an which is divine knowledge “.....Who has created death and life that He may test you who is best in deed..... (67:2)” Generally, the knowledge is received through man's all senses including reasoning. But the knowledge about unseen such as the existence of a creator, life hereafter etc.. which can only be received from the divine revelation (wahy). All Muslims in every era regardless of any sect believe that Qur'an is the final revelation to mankind and fully believe in its authenticity and also all believe that the Prophet Muhammed صلى الله عليه و سلم was the last prophet among the series of Nobel prophets. One of the goals of the Nobel Qur'an is its proper recitation, understanding of its message and wisdom, practicing its teaching and conveying to others. The Nobel Qur'an through the messenger صلى الله عليه و سلم conveys glad tiding as well as the warning . It makes people aware of Allah's plan; why Allah has created this world? ; what His purpose is of settling man on earth? ; what is required from man in this earth? and what man is going to confront after death?. According to the Qur’an, every human is created forever. When Allah created human as such, He divided his life span into two periods, the pre-death period, which is a time of trial in this earth, and the post-death period, which is the time for receiving the rewards or punishment merited by one’s actions during one’s lifetime. The purpose of the Qur’an is to make man aware of this reality. This is the theme of this divine Book, which serves to guide man through his entire journey through life into the after-life. It would be correct to say that man is a seeker by birth. These questions lurk in everyone’s mind: Who am I? What is the purpose of my life? What is the reality of life and death? What are the secret of man’s success and failure? According to the Qur’an, the answer to these questions is that the present world is the testing ground and whatever man has been endowed with in his pre-death period is all a part of the test. The Hereafter is the place where the result of the test will be taken into account by the Almighty and whatever man receives in the life after death, by way of reward or punishment, will be commensurate with his deeds in this world. The secret of man’s success in this life is to understand Allah’s plan and map out his life accordingly. The beauty of Qur’an lies with its eloquence and purity of its impressive style of language . The diction and style of the Qur'an are magnificent and appropriate to its Divine quality. Its recitation moves the spirit even for those who only listen to it without understanding it. The words of Qur’an are clear and balance. It explains important concepts in a precious but simple manner. The speech of the Qur’an is harmonious balance and consistent and every word is irreplaceable. In spite of claims about other books , Qur'an is the most read and the only completely memorized book throughout its history. It is also the most studied book in the world. It has stimulated development of entire disciplines of knowledge dealing with its reading, writing, and interpretation. Hundreds of Millions of copies have been printed or handwritten in nearly every age and every corner of the world without any variant in the text. We will assuredly guard it (from corruption 15:9) this verse is a challenge to mankind and everyone is obligated to believe in the miracles of this Qur'an. It is clear fact that more than 1400 years have elapsed and not a single message of this Qur'an has been changed, although the enemies of the Islam tried their utmost to change it in every way, but they failed miserably in their efforts. As it is declared in the Nobel verse “By Allah He has guarded it every possible way”. On the other hand, for other Divine Holy Books such as the Taurat (Torah) the Injeel (Gospel) no such guarantee was declared and one can see that these scriptures were corrupted in a form of additions deletion or alteration in their original text. Even the languages in which they revealed have been completely lost At present such scriptures are exist in its corrupted form merely in translation and in many versions. The early Muslims have observed that many important words in the Nobel Qur’an have been repeated the exact number of times which is relevant to the natural occurrence. For example, the phrase the "seven heavens" is repeated 7 times The word "day" is repeated 365 times while the word "moon" is repeated 12 times many cases the certain important concepts have been repeated equal number to its opposite idea. For example, the words, "world " and "hereafter" are each repeated 115 times. The word "faith" (iman) (without genitive) is repeated 25 times throughout the Qur’an, as is also the word "infidelity" or the phrase "covering over the truth." (kufr). When we count the word "say", we come up with the result of 332. We arrive at the same figure when we count the number of times the phrase: "they said" is used. The word "shaytan" is used 88 times. The word "angel" is also repeated 88 times. As explain there are many miracles attribute to the Nobel Qur’an, the numerical system may be one of them but describing the numerical system or codes of Nobel Qur'an as the main and important miracle of the Qur'an is not correct. Since the final divine message (Qur’an) was not revealed all at once, therefore, it was not possible to preserve the message in a written book at that time. During the initial stage of Islam as well until today, major emphasis is laid on its correct recitation and through memorization as a means of preserving and transmitting the message. The prophet صلى الله عليه و سلم and his companions (رضي الله عنهمه) used to memorize the message (wahy) as soon as they revealed. Since the beginning, it remains Islamic tradition in every era and every place to recite and memorize the Noble Qur'an because of its enormous spiritually benefits. Hafiz or Hafiza term used by Muslims for someone who has completely memorized the Qur'an. Their numbers must have been in millions living today across ethnic, socio-economic and geographical throughout the world including in the West. One of the live miracles of the Nobel Qur’an is that Allah has made its memorization easy. Allah says: “And We have indeed made the Qur’an easy to understand and remember: then is there any that will receive admonition?” (Nobel Qur’an: 54: 32). The vast majority of the children and adult who memorize by the non-Arabs in most case do not understand or speak the Arabic language. Muslims always took a great care in reciting, memorizing and writing pf the Nobel Qur'an which still continue in this modern time. Recently they have been taking advantage of latest technology as well with little or no opposition in order to facilitate for those could not access the help of qualify teachers or perhaps to enhance their learning and listening experience . Some excellent reciters have recorded the complete Qur’an, adding to the Islamic audio library hundreds of different beautiful voices reciting the Nobel Qur’an. Despite advancement in audio recording technology during last one hundred year, more and more Muslims are taking the painstaking task to improve recitation and memorize the Nobel Qur'an with pleasure. Thus, Allah has inspired Muslims to take care the Nobel Qur’an since it was first revealed to the Prophet صلى الله عليه و سلم until now, and this will continue to be true till the end of time. Prior to 1877 preservation of sound or manner recitation was not possible using any other means other than oral tradition. In the acoustic era between 1877 to 1925 in which phonograph devices were developed. After that the magnetic era between 1945 to 1975 in which tapes technology using the magnetic tape was invented in 1928; audio cassette was invented in 1962. Since 1975 digital era began to that present day in which CDs,mp3 players were in use. Recently reading assistant Quran Learning Pens which use both written copies of a Qur’an (mushāf amīrī only) and digital scanning to improve recitation, understanding and memorizing of Nobel Qur’an. An intelligent personal assistant (IPA) or the Knowledge Navigator using natural language user interfaces (LUI or NLUI) or speech recognition (ASR) systems such as Braina , a natural language interface for Windows OS and Siri for Apple OS and Cortana for android and other similar technology could possibility be utilized in the future to enhance the Qur’an learning experience. According to the prophetic saying the Qur'an was revealed in seven ahruf (dialects) which may allude to the seven Arab tribes namely Quraysh, Hudhayl, Thaqîf, Hawâzin, Kinânah, Tamîm and Yemen which made the recitation and memorization much easier for them. For example, the word 'alayhim (on them) was read by some 'alayhumoo and the word siraat (path, bridge) was read as ziraat and mu'min (believer) as moomin and so on. The Prophet صلى الله عليه و سلم used to recite during the month of Ramadhan to and in the presence of Archangel Jibrail (Gabriel) عليه السلام the Qur’an what was revealed then. However the year he left this world, he read the entire Qur’an twice also known as ‘daur or meticulous re-reading or last review, on this occasion, all ahruf apparently were abrogated except Quraysh ahruf was retained is the ones which continue to stay preserved to this day with uninterrupted succession. A Qiraat is, for the most part, a method of pronunciation and style of the recitations of the Qur'an which may not be directly related to ahruf (dialects). During first two centuries of Islam, there were approximately 25 different Qiraats, but they were not documented. It was only in the third century that Imaam ibn Salaam compiled the first book on Qiraat, ‘Kitaab al-Qiraat’. Thereafter, in the fourth century, Imaam ibn Mujaahid compiled a book, ‘Kitaab as-Sab’ah’ in which he gathered seven Qiraats which were common in his era and commonly known as Qiraat as-Sab’ah. Some other experts in this science added three additional reading also known as Qiraat al-Thalaathah – Asharah. The seven sets of readings accepted by ibn Mujaahid represent the systems prevailing in different districts. There was one each from Medina, Mecca, Damascus and Basra, and three from Kufa. Nowadays the most prominent reading throughout the world is Qiraat ‘Asim Hafs Sh’uba originating from Kufa; follow by Nafîi, Warsh,Qâlûn originating from Medina, mostly recited around North Africa; and Abu ‘Amr, ad-Dûrî, al-Sûsî originating from Basra. Apparently only three Qiraat Hafs, Warsh and Al-Duri are still in print today. Here are some examples of the differences between two widely used readings Hafs and Warsh. The variances whether vocal or orthography between the transmission has made no difference in the meaning or message. Besides having the Qur’an committed to memory, the Nobel Prophet صلى الله عليه و سلم made special arrangements to have the Qur’an committed into writing through his literate companions (رضي الله عنهمه) between 43 to 60 scribes have assisted in this task at one time or another who after writing the text used to read the verses to the Prophet صلى الله عليه و سلم ( as the Prophet was himself worldly illiterate) to ensure there were no shortcoming in its reciting. Zayd ibn Thaabit رضي الله عنه was a prominent companion who may have assisted this task at the most. During those days paper was not readily available in Arabia; therefore, initially these Qur’anic ayahs (verses) were mostly written on Palmwood, tree leaves, on tablets of white stone or piece of cloth and sometimes on silk or shoulder blade of sheep or camel and on parchment. During those days of the manuscripts were collected on various surfaces material, for instance, a verse would appear on parchment, another on tree leaf and yet another on a bone yet they were not entire Qur'an . One Companion would have only a single Surah in his possession while someone else would have five or ten Surahs and some others will have only a few verses. During the battle of Yamamah,( 632 CE) a large number of Hufaz (memorizers) meet their martyrdom, Sayyidna Abu Bakr and Umar have agreed to and appointed Zayd ibn Thabit رضي الله عنهمه to search and to collect the written manuscripts as a matter of urgency. There is another narration in which the prophet صلى الله عليه و سلم at his dead-bed instructed his son in law Ali ibn Talib رضي الله عنه (his third successor) to search and collect the written Qur'an as the highest priority. Until recently in 2015, two leaves (4 pages) of an early Qur’anic manuscripts which were It was found, along with many other Quranic and non-Quranic fragments, in Yemen in 1972 during restoration of the Great Mosque of Sana'a, in possession with University of Birmingham England, were radiocarbon dated between 568 CE and 645 CE, suggesting that it may be among the oldest Qur’an manuscripts to date and might be identified with the text known to have been assembled during the first Caliph Abu Bakr, between 632 CE and 634 CE. These manuscripts were written with ink on parchment, using a monumental Arabic Hijazi writing and is still clearly legible. The leaves contain parts of Surahs 18 to 20. The divine revelation stopped few months before the passing of the prophet صلى الله عليه و سلم (632 CE) at that moment, the Qu'ran was completed and its order and arrangement and manner of reciting were approved by Almighty Allah through his messenger before his death. During Abu Bakr رضي الله عنه period ( 632-634 CE), the entire written Qur’an was first time collected and compiled in a codex (mushāf) on sheets of animal skin in which each Surah was written separately without ayah numbers and placed in their proper sequence in a folder. Up to then the only full official written copy which was collected under Abū Bakr (d.13/634) had remained unpublished which was kept first with Abū Bakr, then with `Umar, ( 632-644CE) and after his death with his daughter Hafsa,رضي الله عنهمه a widow of the Prophet. On returning from the conquest of Azerbaijan (25/645). Hudhayfa رضي الله عنه was disturbed to see that Muslim soldiers from different parts of Syria and Iraq meeting together and differing in their readings of the Qur'ān each considering his reading to be the correct one. Uthmān رضي الله عنه ( third successor 644-656 CE) requested Hafsa, widow of the prophet, asking for the copy in her possession to a number of duplicate master copies to be made to deal with an undesirable situation and it is to be followed as the only authorized Qur'ān in the different parts of the Muslim world. this will prevent the possibility of different versions evolving in time. About 20 years (652 CE), after the passing of the Prophet صلى الله عليه و سلم Sayyidna 'Uthman رضي الله عنه, arranged several master copies (between 4 or 7) to be made as first authoritative certified written copies of Nobel Qur’an (Mushāf) to be sent to various major Muslims regions along with reciters. 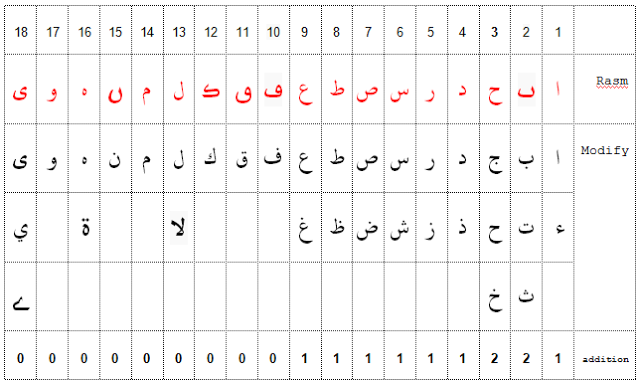 The certified master copies which numbered in 4 or 7 were produced in which not more than 18 out of 29 Arabic letters were distinguishable due to absent of dots ⟨إِعْجَام⟩ (i‘jām, consonant pointing nor the vowel signs (tashkeel diacritical) were employed. for example, letter Ba ب Ta ت and Thaa ث looked that same, this is due to the fact that the practice of placing dots nor the diacritical marks over or under letters was not customary then. At that time, those who could read were so used to this style that they had practically no difficulty in reading dot-less writing mainly because they knew the correct recitation, in a case of doubt they would easily recognize the text by its the context. 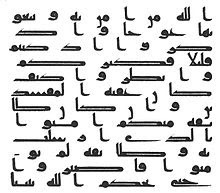 Here is an example of initial 18 rasm letters without dots, 10 additional letters were developed by using the dots plus letter Hamza which represents consonant and letter Alif as long vowel. Rasm-e-Uthmani also knows as rasm al-mushāf - rasm means 'drawing', outline, or pattern in Qur’anic writing and mainly deals with its orthography (spelling) and forming of Qur’anic words. From earlier on the Muslims reached a consensus on a rule that it is not permissible to write the text of the Noble Qur’an using any method other than the rasm-e-Uthmani convention or rules. 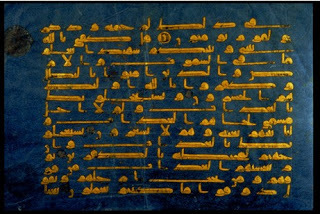 In of authoritative Qur’anic text (rasm) several shapes of the letters share more than one sound, for example, sound bā , tā, thā , it has given rise to great confusion in reading for Muslims beyond Arabia, certain steps were taken gradually ( with some opposition) to improve the orthography, lettering, as well to vowel prolongation sounds. It is to be noted that all Mushāf printed today do meet the rasm-e-uthmani rules. There are many ignorant who suggest that the Qur'an they read is rasm-e-uthmani but not other. When speaking of the rasm, it stands for the basic text made of the 18 letters with its unique orthography without dots i'jam vowel and other diacritics signs. The term script deals with a particular language such Arabic script, roman script etc. The type or style which in computer terminology is called fonts, which deals with the type of calligraphy such as Hijaji, Kufic, Naskh, Nastaʿlīq. There are no differences whatsoever in the Qur’an that Muslims read and recite in Africa, Asia, Europe, America or Australia, and no one ever heard that someone has disagreed ever about the precision of the Qur’an, for all of them have agreed that the Nobel Qur’an that they have today is the same Qur’an that was revealed to prophet Mohammad by Allah. Moreover, Allah has promised to preserve the Qur’an. He says: “We have, without a doubt, sent down the Message; And We will assuredly guard it (from corruption)” (Nobel Qur’an: 15: 9). The written Qur'ān was written in Arabic script and Muslims expected to treat it with great respect. It is prescribed for anyone with a minor ritual impurity is not allowed to touch the Nobel Qur’an or any part, but may recite and anyone with a major ritual impurity is not allowed to touch nor to recite it. Muslims are also expected to respect and attentively listen to Nobel Qur’an the with great care when it is recited. With the spread of Islam beyond the Arabian Peninsula and the increasing number of non-Arab Muslims, there was a greater need for facilitating reading and learning of Arabic. Since several letters of the Arabic alphabet shared the same shapes and vowels signs that were not clearly indicated, some improvement was needed. As a consequence, a system of letter-pointing Nuaqt or I’jam, diacritical marks I'rab and vowel indication tashkeel including sukoon, Nunation tanween, double consonant tashdid prolongation maddah and glottal stop hamzah signs were introduced and perfected well before the first century of Islam without compromising its oral recitation, this system serves as pronunciation keys to as facilitate proper reading. 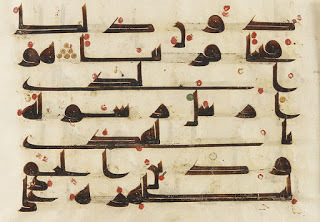 Before the advent of computers, master copies of Qur’ans were and are still hand written (calligraphy) either for personal collection or for copy/reproduction purpose. The woodblock printing of the Qur’an was first attempted as early as the 10th century. The first complete Qur’an printed with movable type was produced in Venice in 1537/1538 for the Ottoman empire. Printed copies of the Qur’an during this period met with strong opposition from Muslim legal scholars: printing anything in Arabic was prohibited in the Ottoman empire from 1483 and 1726 and ban was lifted for non-religious texts only. The printing of Qur’an remained prohibited until 1849 by Scholars of Al-Azhar. It is my understanding that prior to 1950 the copies of Qur’an are generally handwritten and any printing technology prior to the phototypesetting which was developed in the late 1940s, was not suitable for the Noble Qur’an for wide circulation. 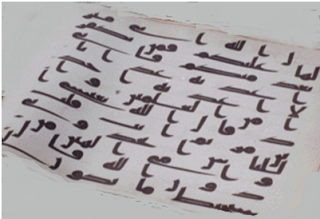 In phototypesetting process, Qur’an pages are hand by a calligrapher then using a camera a negative is made which is used to create a plate then to a printing surface. The present day a widespread circulation than any other edition. 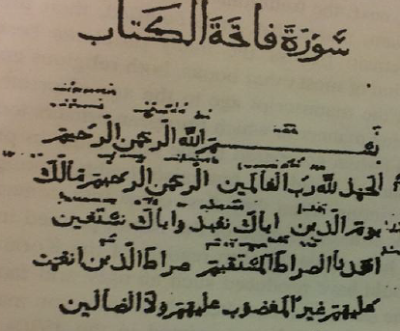 This is the Egyptian/Cairo edition, printed , most likely using typesetting technique, originally in 1337/ 1918. and latter by Institution Shaykh al-maqāri al-misriyya in 1342/ 1923 (a committee of four of set up by King Fu'ad and later his son King Farooq under supervision of the Supreme Council of Islamic Research and Culture in Al-Azhar and was printed at the Official Būlāq Press) This edition known as the amīrī mushāf has been adopted and model to be followed in the most important centres of Qur’an publishing house in the Middle East: Egypt, Saudi Arabia (especially the King Fahd Complex for printing the Qur'ān in Madina) Beirut and Turkey. 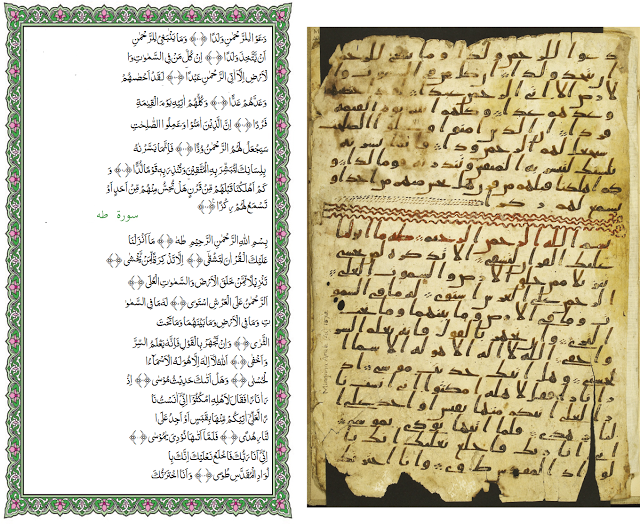 The committee checked (in later editions given as lajnat murāja`at al-masāhif) the copies of the Qur'ān for the specific way of vocalization - tarīqat al-dabt in writing the mushāfs were the same as specified by scholars of dabt citing the traditional authoritative texts. Around 1985 Saudi Arabia has established a massive plant outside city of Medina, King Fahd Complex for the Printing of the Noble Qur'an named as Mushāf- al-Madinah an-Nabawiyyah( Hafs recitation adopted from mushāf-e-amīrī 1930s Cairo edition) which was handwritten by a famous Syrian calligrapher Uthman Taha, apparently it took him more than 3 years in writing and proof-reading and reviewing. The Mushāf-e-Ajmi which mostly used in non-Arab Muslims countries such as central Asia sub-continent Indo-Pak etc. 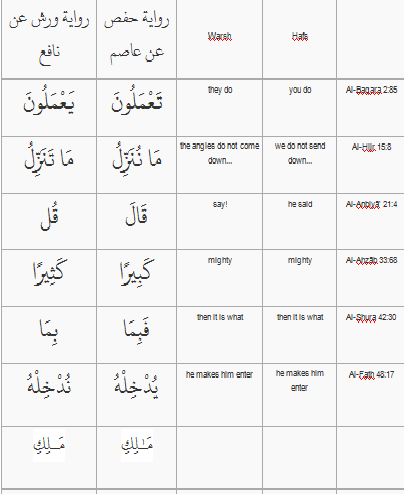 has been simplified so that learners do not need to know essential Arabic grammar rules such as having to differentiate between letter Alif or hamza, mute letters, simplify method for writing alif/hamza, long vowel letters Huroofe-maddah, alif maqsurah or khara-zaber, madd-e-asli maddah ya or khari-zer and maddah waw or ulta-pesh and some other minor variations. and often with letter alif,waw and ya at end of a word. When a vowel or sukun sign is indicated on or under letter Alif it is understood to be letter hamza and not Alif. Ajmi method does not write letter hamza and simply writes short vowel signs. When indicating long vowels for prolongation( letter waw and ya) , Ajmi method add Sukoon/jazm on letter waw and ya to prolong a the letter – where in amīrī method shkun is not placed and remained empty but the letter must be prolonged – it would be confusion for the Ajmi’s user where it has established rule that no sound would be utter if letter has no vowel or Sukoon/jazm signs on it. Idgham means an assimilation of sound from one letter with another. There are six letters of al-Idgham: Ya', Ra', Mim, Lam, Waw and Nun (all six letters in one word are known as Yarmalun) when first five letters come in contact with letter nun.